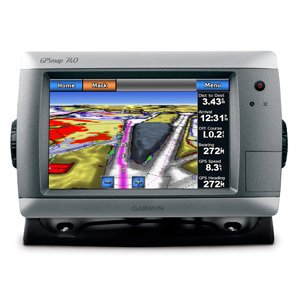 GPSMAP 740s is a stand-alone touchscreen chartplotter that brings a new level of functionality to your vessel. Featuring a brilliant 7" (17.78 cm) display, GPSMAP 740s puts all the information you need right at your fingertips. GPSMAP 740s is preloaded with U.S. coastal maps. In addition, GPSMAP 740s accepts radar input and offers full NMEA 2000® connectivity for greater convenience when adding extra sensors. GPSMAP 740s contains preloaded map data for all U.S. coastal areas, including Alaska and Hawaii, plus Explorer Charts for the Bahamas. GPSMAP 740s also features an internal, high-sensitivity GPS receiver for superior satellite tracking and quicker acquisition times. 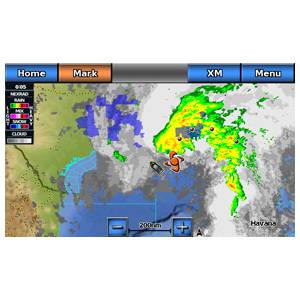 And as an added benefit, GPSMAP 740s can receive graphical weather data for North America through the optional GXM™ 51 satellite receiver/antenna (sold separately). Input is easy with GPSMAP 740s. Whether you’re changing course or simply reviewing information in front of you, the intuitive touchscreen interface makes for simple operation. The device also offers flexible brightness levels for daytime readability along with low-light dimming during night use. And with a widescreen display that’s rugged and water resistant, it’s made to perform in any situation. With the optional BlueChart g2 Vision SD™ card (sold separately), you can add a whole new dimension of exceptional features to your chartplotter. ¹Garmin Marine Network not supported. ²Depth capacity is dependent on water salinity, bottom type and other water conditions (with 1 kW transducer).